Mr S Dhanabalan, the longest serving Chairman of Temasek, will be stepping down from the position with effect from August 1, 2013. Taking his place will be Mr Lim Boon Heng, 65, who joined the Temasek Board as Director June 1, after a career spanning both the private and public sectors. Mr Dhanabalan, 75, has accepted the Temasek Board's request to continue after his retirement in an honorary advisory role with Temasek Holdings. When his Ministry of National Development staff gave him a tearful send off in September 1992, Dhanabalan told reporters he would be spending more time with his church. When he had to make way for Lim Boon Heng as the new Temasek chairman on August 2013, he said same: spending more time with his church, currently Bukit Panjang Gospel Chapel. You gotta take that with a large pinch of salt. My uncle met him at a Varsity Christian Fellowship (VCF) gathering eons ago, when he first donned the white and white uniform (him, not uncle), and asked him why his political party seemed to be unpopular among some circles. The cocky response was that, with 70+ of the votes, they had to be popular. Period. End of sharing. The appointment of a new chairman at Temasek Holdings has revived talk of a new CEO as well. Former Cabinet minister Lim Boon Heng has been appointed chairman of Temasek Holdings. The 65-year-old will replace 75-year-old S Dhanabalan, who retires next month. Mr Dhanabalan will, however, continue to serve as honorary adviser. Singapore state investor Temasek Holdings Pte Ltd said it has named Lim Boon Heng as its next chairman, giving the non-executive role to a former government minister as the firm's long-serving chairman retires next month. Lim joined Temasek's board a year ago and will replace S. Dhanabalan, who will retire on Aug 1. Dhanabalan turns 76 next month and has held the chair for 17 years. The reshuffle will have little impact on day-to-day operations because the chairman is less influential than the chief executive in the running of Temasek. Ho Ching, the wife of Singapore's prime minister, has been chief executive since 2004. Mr Lim Boon Heng’s appointment as Temasek chairman is probably a surprise to many, some of whom think he is too “lightweight’’ to fill in the shoes left behind by Mr S. Dhanabalan. This is despite his being on the Temasek board for the past year, a run-in period in all probability. Doubtless, comparisons will be made between his abilities and those of Mr Dhanabalan, a former heavyweight Cabinet minister who happened to be a founder of the Government Investment Corporation of Singapore and had established the then Development Bank of Singapore. He was also Singapore Airlines chairman. Mr Lim Boon Heng, who is a former cabinet minister and ex-NTUC Secretary-General, has been appointed chairman of Temasek Holdings with effect from 1 August 2013. He succeeds Mr S Dhanabalan, 75, who will retire after helming Temasek Holdings since 1996. Mr Dhanabalan has been the longest serving chairman of Temasek. Prior to joining the Temasek board, Mr Dhanabalan contributed significantly to the transformation of Singapore through decades of public service, and later on in his political career which included appointments as Minister in various Ministries such as Foreign Affairs, Culture, Community Development, National Development and Trade and Industry. Why are there so many complains and criticisms on Boon Heng’s promotion to Chairman of Temasek Holdings? The barrage of attacks were quite uncalled for and getting a bit rowdy and rude sometimes. I want to suggest that everyone should look at the positive side of this appointment. Put it this way, Boon Heng has the breath of experience that is incomparable and unmatched by anyone or any standard. No Singaporean has the kind of experience that Boon Heng has. From all his portfolios, I think the two most relevant appointments to his new appointment must be the NTUC Secretary General and his special assignment to find ways to look after the welfare of the oldies. He was even sent to Japan with a team of high caliber officials to learn how to improve the welfare of old Singaporeans. These two appointments are related in one area, welfare of workers and the oldies. 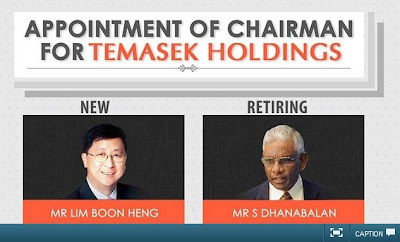 The announcement that Lim Boon Heng would replace S. Dhanabalan as the Chairman of Temasek Holdings is the changing of generals with nothing but the delusion of control over the course of history. It is an announcement full of sound and fury signifying nothing. From my personal conversations with people, I have actually heard generally complementary comments and anecdotes about Chairman Dhanabalan. However, the control over Temasek is dominated by a small number of people and filling the Chairman’s seat requires above all the ability to know how and when to say yes. The appointment of Lim Boon Heng ultimately comes as no surprise. With no experience that would appear to suit him for the chairmanship of a major institutional investor other than being a PAP loyalist, he will fulfill the most important mandate of executing the policies faithfully as they are handed to him. The position could have ultimately gone to any number of PAP men that know where power lies and what their role is within the larger power structure and at Temasek. Why Lim Boon Heng for Chairman of Temasek Holdings? Former PAP cabinet minister Mr Lim Boon Heng has been slated to take over as Chairman of Temasek Holdings in August from the current chair, Mr S Dhanabalan. Mr Lim’s appointment is puzzling because he does not appear to have much of a finance background. Mr Lim studied naval architecture in university and had his first job in Neptune Orient Lines (NOL) as a naval architect. 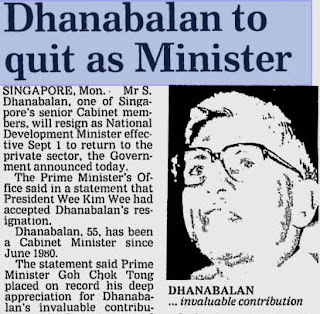 Although he entered politics as a PAP MP in 1980, he only became a cabinet minister in 1991. He was instrumental in floating the concept of town councils, which later became a means of politicizing the grassroots organizations and tripping up the Opposition. Mr Lim’s closest contact with finance and economics was as Senior Minister of State (and subsequently, Second Minister) for Trade and Industry, from 1991 to 1993. Thereafter, he was Minister Without Portfolio until 2001, and then Minister in the Prime Minister’s Office until his tearful retirement from politics in 2011. Speaking to the media at a scholarship presentation ceremony yesterday (27 Jul), Lim Boon Heng, who will take over the Chairmanship of Temasek Holdings next month, said that assuming the appointment is something that is not totally new to him. He said that his experience working at a “private commercial company” and later in NTUC running co-operatives, helps him get a “sense of what investments ought to be”. The last we saw of him was the indelible image of a grown man bawling his eyes out like a baby on national television, after learning that his salad days as full cabinet minister was over. Not only will he no longer enjoy a guaranteed million dollars each and every year, the ultimate status symbol of his residence being guarded by a daily 4-shift change of Gurkhas will also be a thing of the past. Of course his pains were soon soothed by juicy appointments with GLCs and other similarly related organisations. Lim Boon Heng, 65, is flagged as the successor to Dhanabalan, 75, for the chairmanship of Temasek Holdings. Lim was Minister Without Portfolio for 8 years (1993-2001), and then Minister in the Prime Minister's Office for another 10 (2001-2011). Same job, different name, and nobody is any wiser how he earned his money. If Lim Swee Say is pleased as punch about his CPF statements, imagine Lim being delirious over his bank balance. Definitely not something to cry about. The finance professor of a local university was spot-on when he suggested that if they decide to appoint him, it would be because of his political background rather than his financial experience. Flowing along similar non-politically correct lines, he segued into the more obvious, "It is probably more important that the incoming chair possesses the requisite management skills and has a strong sense of duty to the ultimate stakeholders of the fund, that is, Singaporeans." Lim Boon Heng was not able to control his emotions during a press conference, when he was answering the questions of the reporters. He is a chairman of the people Action Party in Singapore, and he was telling the names of candidates for the new batch of PAP. His eyes were full of tears when he said, we were focusing on the people who have low income to upgrade them and brought some favour for them. We saw wages falling and stagnating. 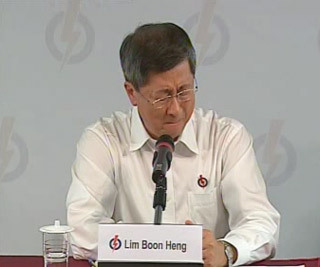 We talk about the poor workers", Lim Boon Heng paused, and he was crying before continues his explanations. Lim Boon Heng was against the casino's is allowed in Singapore. Now, He is agreed on the casino issue, because it will bring a big number of job for the people in Singapore. He said, I don't like the idea of casino, but I have to agree finally for the people who need the jobs desperately. The un-employment ratio is very high. There are many stories are fortune and unfortunate are happening in just one year time of the casino. This is the only reason I agree for this. There are many questions will also be born after the casino's will start work. Lim Boon Heng more said, I really don't care if it is just connected with rich people, but it will also affect many families in the Singapore. We need to work hard for the country and our party as well, He said. PAP Chairman Lim Boon Heng cried openly during a media conference today to introduce the latest trio of PAP candidates when asked by a reporter if ‘groupthink’ may emerge from the PAP policy-makers when there is little robust debate in parliament. Mr Lim denied categorically that there is ‘groupthink’ with the monolithic PAP regime by using the casino issue as an example. Halfway through his explanation, he wept openly, stunning the audience into silence. Lying Crying Boon Heng's Freudian Slip - there is group think after all! He was questioned if there is a group-think within the PAP. LBH then does a crocodile cry to "prove" there isn't any. "Booh-hoo-hoo...you have got to believe me, I didn't support the Casino and my heart has always been with the poor lowly paid workers...boo-hoo-hooo...."
LBH says he does not like the idea of gambling to be used as an industry for Singapore, but at the time it was debated, employment was high. However today, the question is what kind of social problems would there be? A Singapore cartoonist facing jail time over satirical comic strips depicting the city-state’s courts as biased had proceedings against him dropped on today after he made an official apology. The Attorney-General’s Chambers said it would no longer pursue contempt of court charges against Leslie Chew, 37, after he apologised and removed four offending cartoon strips from his “Demon-cratic Singapore” Facebook page. “In light of that apology and undertaking, as well as the fact that the offending comic strips have been taken down, the Attorney-General’s Chambers has determined that it is not necessary to continue the contempt proceedings,” the AGC said in a statement. Dear Prime Minister, your people meet with dismay the news that Leslie Chew has been charged with contempt of court for his political cartoons. At this moment, as the news spreads across the island, we citizens are acutely aware that there is little we could do to call you to a gentler response. The people of our country, yours and mine, are worried for our future. As our young families struggle to meet the costs of their homes and their children’s education; as our best and brightest lose their jobs and their hope in our country and flee abroad; as our middle-aged approach their retirement with trepidation, and as more and more of our aged are reduced to begging or selling tissue paper to survive, we call out to your government with the means at our disposal. But you respond neither with compassion nor with respect but with the manacles of the law. Many years ago, your father began the process of pruning our civic space. He took the televisions and newspapers under government control so that only the best of the news might be published. He restrained the universities and polytechnics so that awkward subjects might not be examined and students might be quelled. He deployed the Internal Security Act and tortured his opponents. And every so often he sued and bankrupted the politicians so as to remind us of the danger of speaking in our own behalf and that of our neighbours and friends. The Attorney-General's Chambers (AGC) said following a review of evidence in investigation papers, the Public Prosecutor had determined that no further action be taken against Chew for any offence under the Sedition Act. The statement added that Chew was informed of the decision earlier on Monday. His police bail will be allowed to lapse and his passport will be returned to him. The Attorney-General's Chambers ("AGC") has completed its review of the investigation papers relating to Chew Peng Ee, also known as Leslie Chew. Leslie Chew was arrested on 19 April 2013 as part of investigations into whether he had committed offences under the Sedition Act in connection with his publication of the comic series "Demon-cratic Singapore" on Facebook. He was released on bail on 21 April 2013 and has remained on bail since. In a statement today (29 Jul), the Attorney-General’s Chambers (AGC) said it has completed its review of the investigation papers relating to cartoonist Mr Chew and decided not to take action against him under the Sedition Act. Mr Chew was arrested on 19 April 2013 as part of investigations into whether he had committed offences under the Sedition Act in connection with his publication of the comic series “Demon-cratic Singapore” on Facebook. He was released on bail on 21 April 2013. The government has announced that it will not charge "Demon-cratic Singapore" cartoonist Leslie Chew with sedition. The decision of the Attorney-General's Chambers is spot on – notwithstanding the wishes of a grand total of 140 individuals who signed a petition asking the government to throw the book at him. As this blog pleaded three months ago, if the government feared that Chew's criticism of its race policies would have any traction, it should respond with arguments, not force. Chew is not off the hook yet. While the Sedition Act won't be used against him, he has committed contempt of court, the AGC says. His fate now hinges partly on how the court reads the law on scandalising the judiciary. Singapore has traditionally taken a tough line. Recall how three activists were jailed five years ago for wearing t-shirts emblazoned with kangaroos in judges' robes. Since then, however, the courts' thinking has evolved. In the Alan Shadrake case, the Court of Appeal applied a more liberal "real risk" test for the first time. Shadrake's conviction was upheld, so the shift in thinking was barely noticed beyond legal circles. Chew's lawyers, M. Ravi and Choo Zheng Xi, may ask the court to refine its thinking further and rule that – regardless of how inherently insulting the cartoons may have been – Chew does not merit a jail term or fine. A degree of common sense prevailed when the Attorney General's Chambers (AGC) decided against charging cartoonist Leslie Chew for publishing cartoons deemed possibly as offences under the Sedition Act. Singapore prosecutors are pursuing charges against a local artist for alleged contempt of court over cartoons he drew that authorities say had scandalized the judiciary. Leslie Chew, 37, has been under police investigation since April for potential wrongdoing in several cartoons he drew for his Internet comic strip. The Attorney-General’s Chambers this week launched formal legal proceedings against Mr. Chew over five of his cartoons, the agency said Thursday in a statement. The proceedings are “aimed at protecting the administration of justice… and upholding the integrity of one of our key public institutions,” the agency said. Singapore’s High Court accepted the application in relation to four cartoons and set the next hearing Aug. 12. Singapore government lawyers have started legal proceedings that could result in a political cartoonist serving a jail term, in another sign that the long-ruling People's Action Party (PAP) is becoming increasingly intolerant of opponents, critics said. Chew Peng Ee, known to followers of his "Demon-cratic Singapore" site on Facebook as Leslie Chew, had committed contempt of court "by scandalising the judiciary of the Republic of Singapore", the Attorney-General's Chambers said in a statement on Thursday. The charges stemmed from four cartoons that Chew had published in 2011 and 2012, three of which were about the perceived unfairness of the courts when imposing punishment. His case will be heard on Aug. 12. Now this is something to chew on: the commencement of legal proceedings on Thursday against cartoonist Mr Leslie Chew has led to several online petitions. Let’s start with the one urging the G to stop all legal action against Mr Chew. As of today, 727 supporters have signed the petition. Strange, given that The Online Citizen (TOC) had posted it on their own FB page, with the post getting 310 likes and 32 shares. So why has the FB support not translated to more signatures on the petition? Reading through the comments, some signatures stand out. For example, “Paul Ananth Tambyah” said: “It is a sad day indeed for Singapore when a cartoonist is charged for his art.” Could this be the same Dr Paul Ananth Tambyah who has been involved with the Singapore Democratic Party (SDP) and is a member of its Healthcare Advisory Panel? The most telling thing about the Leslie Chew case is the general unimportance of his actions. When I write this, I mean absolutely no disrespect to Leslie Chew. Rather, I am talking about perspective. The Singaporean government judiciary will bring far more scorn, mockery, and publicity upon itself by pursuing this case than ignoring it. It is also an amazingly cowardly act. Leslie Chew a Singapore resident wrote some mocking political cartoons, something that would in most every country not ranked 149th globally in press freedoms, would be ignored. Every citizen of Singapore ought to feel deeply unsettled by the investigation and prosecution of cartoonist Leslie Chew. The case only strengthens my opinion about the Singapore legal system, building on my time researching the political history of the city-state, including the actions that the state has taken against members of the SDP. A charge of contempt of court levied against Mr Chew indicates that the Attorney General ‘s Chambers (AGC) feels that Mr Chew’s cartoons have undermined the authority and integrity of a judge and/or the courts. The need to protect against contempt of court stems from the judiciary’s role as arbiter and administrator of justice. In Singapore, this need even overrides the constitutional right to free speech. * The court protects your rights, the thinking goes, so to protect the court we must limit your rights. Try wrapping your head around that one. Despite his arrest for sedition earlier this year, Chew continued to mock this ‘fictional’ country’s government while other artists in his plight would have toned down the political barbs or stopped drawing altogether. In the 3 Jan 2012 strip, the AGC may have taken offence to the use of the term ‘Kangaroo Court’ and the suggestion that the courts give preferential treatment to celebrities when they get into trouble, in this case ‘Quan Feng Feng’. Just a week prior to this, Mediacorp host Quan Yifeng was sentenced to 15 months’ probation for trashing a taxi, citing mental illness in her defence. Chew may be talented with colouring pencils but subtlety is clearly not his forte. For one, he tweaked the name of every character but left ‘Singapore’ intact. Blogger Alex Au of Yawning Bread was lucky to escape with an apology and removal of his post for likewise SCANDALISING the courts by suggesting that another celebrity, plastic surgeon Woffles Wu, was let off easy after getting an elderly scapegoat to take the rap for his speeding offence. Incidentally, Chew also took a swipe at the Woffles (or rather, Waffles) Wu verdict in his 16 July 12 post. Does a picture paint a thousand contemptuous words here? Or perhaps it’s the ‘Kangaroo Court’ jibe that got the AGC hopping mad. In 2008, a trio wearing kangaroo T-shirts to the Supreme court were slapped with jail terms up to 15 days for ‘scandalising the Singapore judiciary’, their depiction of the proverbial marsupial in judges’ robes considered the ‘worst insult possible’. Worse than calling the law ‘stupid’ or a ‘senile old fart’ perhaps? Once more with feeling! Poor Leslie Chew is getting famous once more. Not sedition but contempt of court! SDP is bound to back their favourite cartoonist as they have done so in the past. Why is AGC out to thump Demon-cratic again? Two simple reasons. The earlier sedition charges were not punitive enough and the cartoons did not stop or at least tone down despite the obvious warning to Leslie to stay low. Hence, if Demon-cratic was dumb enough to be stubborn, urged on by his fans, friends and SDP for all we know, AGC is going to take action for the Super White and fine and/or jail Leslie to scare the monkeys. Too bad for Leslie but it is all good for him as he wants to be a rebel. It gives his defiant cartoons more street cred and omph. But why pick Leslie and not the others? Also why now? Hmmm part of the broader hard touching of some but not others in the Internet? BTW Anti-death penalty UK citizen Alan Shadrake was sentenced 6 weeks jail and fined $20,000 for scandalising the judiciary. I'm not a big fan of Demon-cratic's lame messages compared to other cartoonists, also because he used software rather than hand draw like the others, so popcorn out, watching the show and waiting to see what would happen to Leslie. Nothing good I bet! I think 3 weeks and $10,000 fine. Gulp. Many Singaporeans have been following the events following Cartoonist Leslie Chew's arrest in April. It has now been revealed, after months of investigations and repeatedly extended bail, that he will be charged with contempt of court. We can no longer stand by and allow the Singapore Government to smother free speech and expression. Just because they do not agree, does not mean that they can use their legal prowess and the people's money to oppress individuals and shut them up. We need alternative opinions, to have discussions, to learn to make our own judgements about what is right and wrong in order to grow as a nation. We will no longer be coddled and treated like an impressionable child. We will no longer be oppressed. All of us should now be familiar with the case of Leslie Chew, the cartoonist of Demoncratic, being sued for contempt of the judiciary. TRE has posted a couple of articles on this and a call for donation to Leslie Chew to pay for his legal fees. There are many reasons offered on why everyone should support Leslie Chew and also why is this very necessary. Some even suggested turning this into a fund for future use exactly for such cases when bloggers are sued for engaging in such ‘nefarious’ activities like blogging on social and political issues that are important to every citizen of this City. It is only prudent to expect seeing more of Sue and more bloggers needing funds to defend themselves when Sue is now the number one darling of people who are unhappy with what appears in the social media. Good time to lock-in housing loans? Relax a little, You have Wisdom !! Haze: "A minister rises from the ashes"